I recently completed a two-year research fellowship at the Canadian War Museum in Ottawa. In July 2007 I arrived at the Museum with plans to explore the history of Canadian military mechanization and logistics. After completing a few trial articles on various aspects of the twentieth-century experience, I settled on the First World War as a principal research objective. After all, that conflict happened on the threshold of the automobile age, and the fighting marked a key phase in the evolution of military transport from animal to mechanical power. Although I had an office space at the Museum, I typically spent several days a week up the street at Library and Archives Canada, mining the records of the Canadian Expeditionary Force for material on motor vehicles, transport, supply, roads, tactical railway, and anything else related to mechanization during the period. I came away with a lot of material, and have signed a contract to write a book on my findings. Me and my workshop volunteers piled onto a 1970s-vintage Canadian Forces M151A2 ¼-ton truck that we have just reconditioned. This truck is fitted with the TOW missile special equipment vehicle (SEV) kit, although a launcher has not yet been added to the pedestal mount. Not every project in the tank shop was a full restoration. Some involved relatively minor conservation efforts, while others entailed a complete tear down and rebuild. Among the more unusual conservation projects was some work that we did on a roll top desk that had belonged to Sir Arthur Currie. (Currie’s desk was not alone in the collection; there was another that had been used by Sir Frederick Borden and Sir Sam Hughes during their respective tenures as ministers of militia.) I doubt that Currie, when he went to war as an untried brigadier in 1915, could have imagined that his office furniture would one day grace the collections of a national museum. Hughes, on the other hand, probably would have expected nothing less. The larger artifacts that passed through the Tank Shop, such as the heavy armoured vehicles or aircraft were all impressive in their own way. One of the ongoing restoration projects that I will not soon forget was the Fi 103R-4 V1 Reichenberg flying bomb. The Reichenberg was a last-ditch version of the conventional V1 that caused so much grief in Britain during the closing stages of the Second World War. The difference was that instead of a mechanical guidance system, the Reichenberg was fitted with a cockpit for a human pilot. Although said pilot was equipped with a seat-type parachute, there is no doubt that the Reichenberg was a suicide weapon. Although about 175 examples were manufactured, in the end, the machines were not flown operationally. The Museum now houses one of only five known surviving examples in the world. 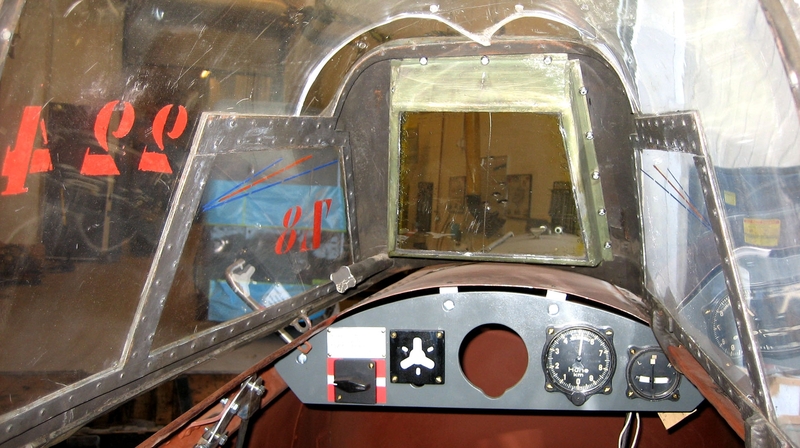 A view of the partially restored instrument panel from the Reichenberg cockpit. The canopy glass is original. Not all of the equipment that my team worked on carries so sinister a legacy as the Reichenberg. Near the end of my time in the Tank Shop we fixed up one of the little Hough/International Harvester mules (properly called a ‘tractor, aircraft towing’) that had shuttled aircraft across the decks of HMCS Bonaventure, the Canadian Navy’s last aircraft carrier, decommissioned in 1970. The mule was painted in a high visibility black and yellow two-tone pattern, like a bumblebee. It was hard to imagine this little machine working on the decks of the Bonnie out in the blue water spray, but so it was. I believe that this maritime artifact has since been sent across town, on loan to the Canada Aviation Museum. One of the projects that was starting to get underway as I left the shop was a rebuild of one of the very few surviving First World War-vintage M1917 6-ton tanks brought up to Canada from the United States for training purposes early in the Second World War. The M1917 was essentially similar to the Renault FT-17, the most-widely produced French tank of the First World War. Many parts are missing from the Museum’s M1917, but these will be fabricated to recreate a complete tank. Working on vintage vehicles of my own, I often wonder who will care for them and what will become of them after I am gone. Although my time in the Tank Shop was short, I never worried about what would become of the artifacts that we spent so many hours restoring or conserving. They belong to the Canadian people, and will be preserved in the national collection for generations to come. I am proud to have made a small contribution to that legacy.